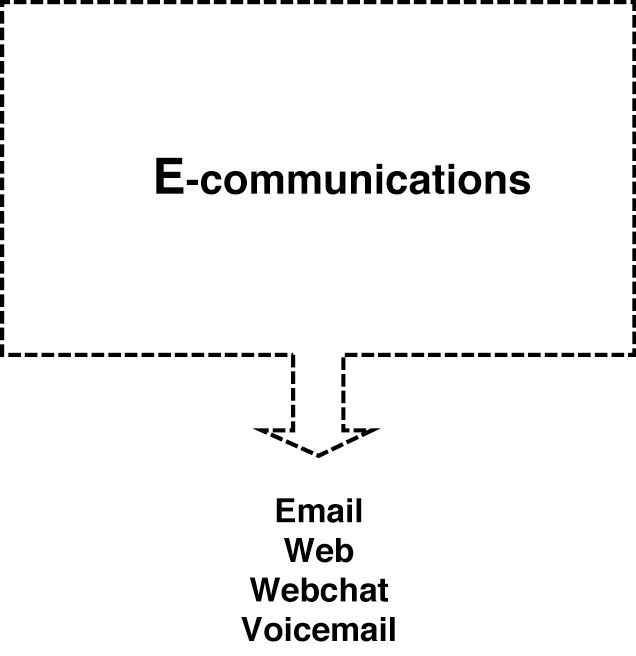 While the dot.com bubble may have burst, one of its legacies is thriving - e-communications (see Figure 5-1). From corporate intranets to e-newsletters as well as the all-pervasive email, we are all more connected, or e-connected, than ever before. Rosabeth Moss Kanter has written, "Communication is the core of e-culture." Much of this connectedness is good. We can work from home, from the airport, from a remote office, or from a beach in the Bahamas - often more productively - thanks to the proliferation of e-communications. Being connected 24/7 is our mantra - always on, always available. Email facilitates the day-to-day commerce of an organization. It is used for this purpose in nearly every organization. Since people receive so much email (50 to 100 emails per day is common), you need to be selective. Choose your moments. The leadership message, as always, must be rooted in the values of the organization and must be of significance to the recipient. It must be designed to further a sense of trust. Therefore, keep the messages consistent with your culture and your values. When Jack Welch used email to keep in touch with employees, it was an outgrowth of his habit of sending written personal notes. Our vision challenges us to undertake some exciting new opportunities. We can be the organization we all want to be. Let me tell you how . . .
We are a people-centric organization. We attribute our success to your contributions. Let me take this opportunity to recognize some key contributors. I want to tell you how much I appreciate the work you have been doing for us. I know that you have been sacrificing personal time for this project, and I want you to know that your effort has not gone unnoticed. You are working very hard for us. People are always telling me what a hard worker you are. I want to give you some advice about how you can become better. First, . . .
Brevity is the better part of valor with e-leadership messages. No one has time to read a lengthy message, and if the message is too long, people probably will not read it at all. Note: Be careful when you send. Check that you have clicked the correct recipient. Do not copy people on e-coaching sessions. To do so may be a violation of trust between you and the employee. Think of virtual communications as a great way for leader and employee to have a conversation. While nothing can, or should, replace the dynamism of the face-to-face conversation, virtual communications through email is an effective way for the leader to share his or her thoughts and to reiterate the leadership message, provide guidance and direction, and keep abreast of changing conditions by listening to feedback. Email invites response. With the exception of broadcast emails, which go to thousands, the email to a direct report typically carries with it the demand for a response. The leader needs to know, "Did you understand what I wrote?" and the leader needs to hear, "Yes, and let me offer my thoughts on this." When used in this way, email facilitates dialogue. If both sides pay attention to what the other is saying (and keep in mind that the leader is communicating with more than one follower), you increase the capacity for trust to develop, which should always be the ultimate outcome of leadership communications. He was known as the Sage of Claremont, referring to the school in southern California where he lived, taught, and wrote. He was still vigorous in his early nineties, and people came from around the world to hear him. And he came to the world via satellite lectures. "I like bigness," he said. He split his consulting time between fee-paying and pro bono clients. For seven decades he persuaded, nudged, and cajoled organizations to regard workers as resources and management as the enabler of organizational effectiveness. He is Peter Drucker. Born in Vienna in 1909, Drucker recalls his earliest memory at age 5 as someone in his family referring to the "end . . . of civilization." It was the beginning of World War I, which ended the spirit of the nineteenth century and ushered in the modern age, complete with its own horrors but also its possibilities. Somehow it seems fitting that Drucker, the creator of a new way of viewing management that would destroy an older form, would have this as his first memory. First and foremost, Drucker considers himself a writer. In fact, he had been an accomplished financial writer prior to his emigrating to the United States from Germany as Hitler was coming to power. While his views have evolved over the decades, chiefly under the influence of behavioral scientists like Abraham Maslow, Drucker is noted for the significance of his work, the constancy of his message, and the frequency of his messages. He is a leadership communicator par excellence. His exploration of the management scene began with an assignment from a senior vice president at General Motors who wanted to find out what made his company tick. The result was The Concept of the Corporation. Alfred Sloan, the chairman of General Motors, hated the book, but he did not discourage Drucker from publishing it. Fortunately, Drucker did so. American management was never to be quite the same. Drucker's seminal management work - in fact, the work that many credit with inventing the field of management - is The Practice of Management. Appearing in 1954, this resource quantified the role of the manager as the person responsible for goals (management by objectives) and concerned with the accomplishment of results through others, as well as having a total perspective on the business and its place in the competitive landscape. What Drucker did in this resource, and 20 years later in Management: Tasks, Responsibilities, Practices, was to quantify the manager's role, not in some learn-by-rote, restrictive way, but rather in a Churchillian neo-heroic way that would cause the manager to see himself (and later herself) as one who can accomplish things, and in so doing aspire to something greater. That theme of aspiration for something better - a new system, a new management discipline, a new social order - is inherent in all of Drucker's work. From where did Drucker's ideas spring? He learns as he talks to people, and he also discovers his point of view as he teaches or writes about it. Curiously, Drucker credits a course in admiralty law, which he took as part of a doctoral program in Germany in the twenties, with giving him his management insights. To Drucker, management is "an integrating discipline of human values and conduct, of social order and intellectual inquiry . . . feed[ing] off economics, psychology, mathematics, political theory, history, and philosophy. In short, management is a liberal art." Drucker was as much a social philosopher as he was a management consultant. His canvas is not limited to the boardroom, or even to the spans of a global corporation. Drucker had a wondrous ability to link the issues and challenges of modern management with history, be it ancient Greece, Rome, or China. He dropped in historical anecdotes the way other writers use punctuation. The effect is to place management squarely within the entire span of human history. And lest we forget it, Drucker is a teacher; his books are his lectures, his visions, and his arguments for adopting new ways of thinking and doing. At the same time, Drucker knew how to keep it simple. He loved organizing concepts into easy-to-remember paradigms, e.g., "The Ten Rules of Effective Research . . . The Five Deadly Business Sins . . . Two Cores of Unity." The contrast between the grand themes and the plain and simple gets to the core of Drucker's influence - he is relatively easy to understand. He is not simplistic; his words, images, stories, and paradigms are used to make the abstract seem vivid and accessible. One of his later essays, Managing Oneself, applies his management insights to the individual. In the article, Drucker makes a striking insight into leadership communication styles with another of his historical allusions. He relates how General Dwight Eisenhower was loved by the press for his crisp, succinct responses to their questions. A decade later, President Eisenhower was reviled for his mumbling responses and his butchery of the language. The reason, writes Drucker, is that Eisenhower was a reader, and he read specially prepared briefing papers prior to his wartime press conferences. As president, Eisenhower tried to rely on give-and-take with the press and wing his answers; it didn't work. Franklin Roosevelt and Harry Truman were listeners and could roll with the reporters' questions. For Drucker, it is a matter of knowing how you process information, orally or printed. Knowing what you are will enable you to communicate your point of view more effectively. Drucker devotes a chapter to managerial communications in Management: Tasks, Responsibilities, Practices. He draws a distinction between information and communication. Information is data - "formal" and "logical." Communications is perception - how we interpret the data. Communications then becomes, as Drucker says, "the mode of an organization," meaning how the organization uses communications to function. Commands (e.g., information) flow downward, but genuine communications (perception) stands apart from hierarchy; it is peer to peer or person to person. In The Concept of the Corporation, Drucker writes that "Management is the organ of institutions, the organ that converts a mob into an organization, and human efforts into performance." For Drucker, it is management that tames the wild beast of anarchy and enables people working together to achieve great results. And it is Drucker's words and teachings that have made the topic accessible to generations of managers. Draw analogies. Make use of metaphors and parables. Drucker is forever sprinkling his texts with artful images and little stories. Illustrate with historical references. Reading Drucker is reading history. Whether he is citing the ancients in Greece or China or making reference to modern Europe, Drucker uses historical references to place his lessons in the context of history. Share the learning. Teach what you know. Drucker is a teacher; he wants people to share his ideas. Admit mistakes. Unlike some academics, Drucker admitted his mistakes. He underestimated the role of behavior in management until he read Maslow. As a result, he changed his point of view and in the process made his lessons more instructive. Live your message. Looking at the whole of Drucker's writings, we can discern consistency and constancy in his messages. Again and again he pleads the case for the besieged manager, always trying to show him or her a better way. Carol Hymowitz and Matt Murray, "Management-Boss Talk: Raises and Praises or Out the Door," Wall Street Journal, June 21, 1999. Jack Beatty, The World According to Peter Drucker, p. 3.Ibid., pp. 49-68.Ibid., pp. 56-60. Stuart Cranier and Gary Hamel, The Ultimate Business Library: 50 Business Books that Made Management, pp. 75-81. Peter Drucker, "Managing Oneself," Harvard Business Review, March-April 1999; and Beatty, World According to Drucker, p. 30. Peter Drucker, Landmarks of Tomorrow: A Report on the "Post-Modern" World, 1959, pp. 141-142, and Peter Drucker, The Frontiers of Management, p. 227, quoted in Beatty, World According to Drucker, p. 14. Beatty, World According to Drucker, pp. 25-26. Peter Drucker, Management: Tasks, Responsibilities, Practices, pp. 481-493. Peter Drucker, Concept of the Corporation, (1945), p. 132, quoted in John Micklethwaite and Adrian Wooldridge, The Witch Doctors: Making Sense of the Management Gurus, p. 77.